London - Roger Federer produced a comfortable second-round victory in quick time Tuesday, overpowering Spain's Guillermo Garcia-Lopez 6-2, 6-2, 6-4 for a third-round place at Wimbledon. Second seed Federer was not distracted from his mission to win a record 15th Grand Slam title next weekend as he advanced in less than 90 minutes. The win was his 46th at the event which has won for five of the last six years, losing his title last year to Rafel Nadal. The World no. 2, Roger Federer has stormed in to second round after defeating Taiwan's Lu Yen-Hsun in the first round of the men's single event of the Wimbledon tennis tournament. Federer, who is on hunt for his record 15th Grand Slam, has defeated Yen in straight sets by 7-5 6-3 6-2 in the first round. In the first set, there was a close competition between Federer and Yen as the set went to tie-breaker in which Federer won the set by 7-5. London, June 9 : Tennis great Roger Federer, who cemented his place in the history books as he became only the sixth man to complete a full set of major titles, believes Andy Murray's maiden major title could come at Wimbledon next month. 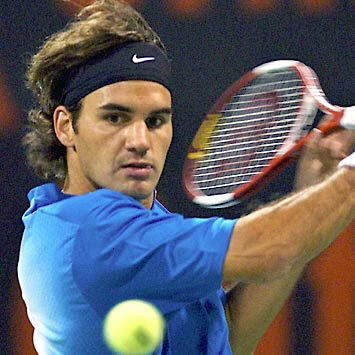 Federer is a strong favourite to win Wimbledon this year after he equalled Pete Sampras' overall record of 14 grand slam titles by winning French Open. Federer knows that reclaiming his crown will not be easy, especially with Murray improving fast. 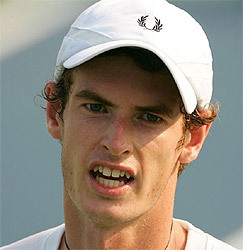 "Andy Murray's best surface might be grass - I think he's playing excellent," The Guardian quoted him, as saying. Roger Federer has won his first ever French Open title and became sixth man to win the Grand Slam of all the major titles in tennis world. Federer defeated Robin Soderling in the final of French Open at Roland Garros on Sunday. Federer won the final match against Robin Soderling in straight sets by 6-1 7-6 (7/1) 6-4. The Swiss player had lost last three finals against Rafael Nadal in the French Open. But this time Nadal crashed out in the second round of French Open and Federer cashed on this opportunity by winning French Open title. Paris - Roger Federer can't help but back himself to lift a sixth Wimbledon title after achieving history with his first French Open crown. The Swiss told reporters on Monday that he's ready to take back his grass-court title from Rafael Nadal. "I think I'm favourite at Wimbledon with the success that I've had," said the 14-time Grand Slam champion, level alongside Pete Sampras as the man with the most majors in his resume. Hamburg - While Roger Federer said it would take a few days until his historic French Open title would really sink in, the praise was long being heaped on him. Federer became the sixth player in men's tennis to win all four majors and with his first Paris crown on Sunday also matched Pete Sampras' leading 14 Grand Slam titles. And it was no one else than Sampras, who never completed the Grand Slam because he couldn't win Paris, who led the choir. Paris - Svetlana Kuznetsova will soon have to replace her hero-worship for Roger Federer, speaking to the Swiss as something of an equal after claiming her second Grand Slam title with victory at the French Open. Paris - Even in a five-set victory Friday, which moved him into his fourth straight French Open final, Roger Federer felt the pain of beaten semi-finalist Juan Del Potro. "I was sad for him, because he's a young player," the world number two said of the 20-year-old Argentine ranked fifth. "You always think that there aren't that many opportunities, that many chances for younger players. "I respect him awfully because he made considerable progress, and I'm certain he's going to be a great player in the future." 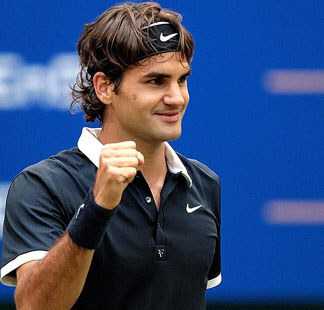 World no 2, Roger Federer has defeated Tommy Haas of Germany in pre-quarter final and entered into quarter-final of the French Open at Roland Garros. Federer defeated Haas in a match which lasted for 5 set by 6-7 (4-7) 5-7 6-4 6-0 6-2. Earlier, world no 1, Rafael Nadal crashed out as he lost his match against Sweden's Robin Soderling. 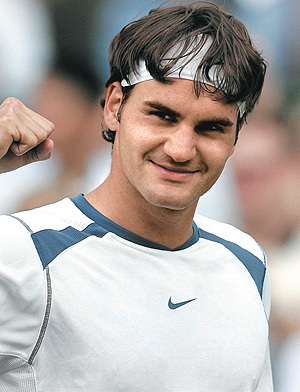 In this match also, once it was looking that Federer will lose match as Hass won first two sets against Federer. 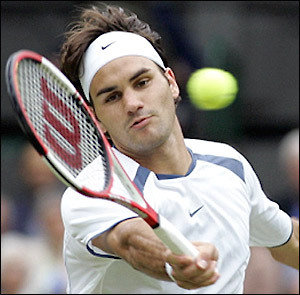 But, Federer came back very strongly and won last three sets to win the match against Haas in the French Open. Paris - Roger Federer flirted with the second major French Open earthquake in as many days Monday before rallying dramatically from the brink to reach the quarter-finals from two sets down for only the fifth time in his career. The Swiss second seed, his path in Paris somewhat cleared by the weekend shock elimination of four-time champion Rafael Nadal by free-swinging Swede Robin Soderling, didn't make life easy for himself in a 6-7 (4-7), 5-7, 6-4, 6-0, 6-2 win over longtime rival Tommy Haas. 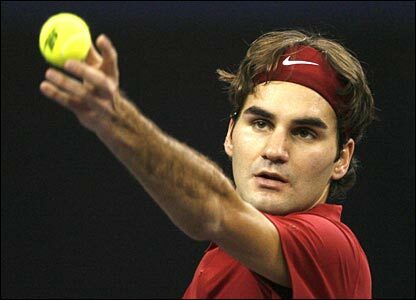 Hamburg - Rafael Nadal stayed well clear of Roger Federer in the men's ATP tennis rankings published Monday. Switzerland's Federer claimed his first match victory against Spanish rival Nadal since late 2007 in a 6-4, 6-4 win over the world number one Sunday at the Madrid Masters. Madrid - Satisfied Roger Federer found little fault in his game despite taking three sets to defeat Andy Roddick 7-5, 6-7 (5-7), 6-1 to book the first semi-final place at the Madrid Masters Friday. The second seed will have the benefit of at least six extra hours of rest while potential opponents Andy Murray and Juan Del Potro start a night battle after top seed Rafael Nadal meets fellow Spaniard Fernando Verdasco at the Magic Box. Third seed Novak Djokovic was facing wild card Ivan Ljubicic of Croatia. Madrid - Swiss split the difference as Roger Federer posted a quick win in less than an hour while Stan Wawrinka laboured for three times that long in a third-round loss to Juan Del Potro at the Madrid Masters Thursday. Second seed Federer, trying to whip his clay game into top shape with Roland Garros starting a week from Sunday, crushed American James Blake 6-2, 6-4 to win his ninth match of 10 played in that series. Blake, seeded 14th and a surprise finalist last weekend on clay in Estoril, won his only encounter at the Beijing Games, their last meeting. Monte Carlo - Roger Federer lost for only the third time in his career to a compatriot, going out to Stan Wawrinka 6-4, 7-5 on Thursday at the Monte Carlo Masters for his earliest clay exit in five years. Novak Djokovic earned a night win over Spaniard Alberto Montanes 6-1, 6-7 (4-7) 6-0, and Scot fourth seed Andy Murray fought through a 13-11 tiebreaker with Italian Fabio Fognini before rain interrupted their second set on serve 1-0 to Murray. Wawrinka played to his own strengths on his favourite surface to leave his second-seeded Davis Cup team-mate and fellow Olympic doubles gold medallist flat-footed in the third-round defeat in one hour, 50 minutes. Monte Carlo - Roger Federer failed badly to lift his clay game on a grey day as the three-time finalist went out in the third round to Swiss Davis Cup companion Stanislas Wawrinka 6-4, 7-5 Thursday. The rain-hit day was a drain on all involved, with matches starting five hours late on the heavy clay. Federer was well off his game against his good friend, as Wawrinka won for the first time in their series after two ATP defeats. Monte Carlo - Roger Federer and Davis Cup team-mate Stan Wawrinka advanced into a Swiss showdown at the Monte Carlo Masters on Wednesday as Rafael Nadal made a winning start to another clay-court marathon season. Newly-married second seed Federer had to fight through as Italian Andreas Seppi saved three match points before exiting 6-4, 6-4 to the 13-time Grand Slam champion. Monte Carlo - Roger Federer and Davis Cup teammate Stanislas Wawrinka advanced into a Swiss showdown in the third round of the Monte Carlo Masters on Wednesday as Federer kick-started his spring clay season. The newly-married second seed had to fight through as Italian Andreas Seppi saved three match points before exiting 6-4, 6-4 to the 13-time Grand Slam champion. Number 13 Wawrinka spent more than two and a half hours in his struggle with Argentine Marcello Vassallo Arguello to seize a 2-6, 7-5, 6-2 victory. Monte Carlo - Fellow ATP players were not a part of the mix as Roger Federer married longtime girlfriend Mirka Vavrinec last weekend in an all-but-secret Basel ceremony. The hometown vows for the Swiss number 2 and his pregnant companion of nine years were kept strictly among friends and family at a location the new groom still won't reveal.